Ring Masonic, Masonic Rings or Rings Masonic; whatever term you use to find us, rest assured that Fox Jewelry wants to be your “Go To” supplier of Masonic accessories. 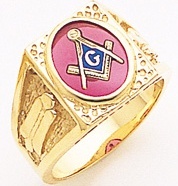 Founded in the year 2000, our mission is to be the supplier of choice for your Masonic and other fraternal accessories. While our specialty is in dealing with Masonic Rings and all of the other degrees associated with Freemasonry, Fox Jewelry also deals in Knights of Columbus, Eagles, Elks, Odd Fellows and Moose accessories. Using ring masonic just happens to be one of the best search terms to find us at Fox Jewelry. Fox Jewelry located in Sioux City, Iowa was one of the first online businesses to deal with Masonic Jewelry. The owner, Robert Fox founded the company and continues to oversee the operations of the company to ensure that Fox Jewelry handles only the best quality Masonic Rings available at the best prices possible. The company’s customer service team is dedicated to being the best in the business. Robert Fox is a member of the North Riverside Lodge 662 located in Sioux City, Iowa, the Scottish Rite, York Rite, Abu Bekr Shrine Temple and the Royal Order ofJesters. Our choice of suppliers is to deal with other Mason’s whenever possible. Thus the term “Made by Masons for Masons”. We believe that given the choice, our preference is to deal with other Masons any time that we can. I will say it again, Ring Masonic, Masonic Rings, RingsMasonic or quality Masonic Rings, search with whatever term you need to do to deal with a professiona lwhen searching for the perfect Masonic Ring. We don’t believe in Pay Per Click Ads. Our page ranking is determined by the amount of traffic that we have on our site as well as the number of external links and happy customers. We at Fox Jewelry continue to bring you the largest selection of Masonic Rings and other Fraternal Rings at the best prices possible. You are currently browsing the archives for the Masonic General category.